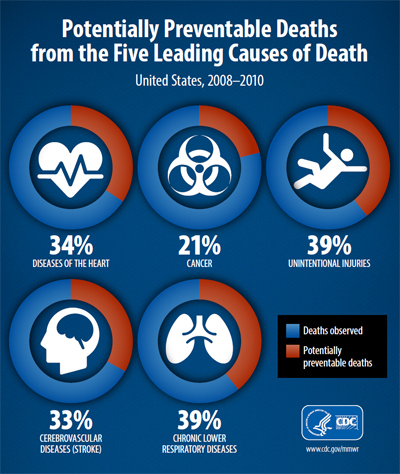 The numbers of preventable deaths from each cause cannot be added together to get an overall total, the authors note. 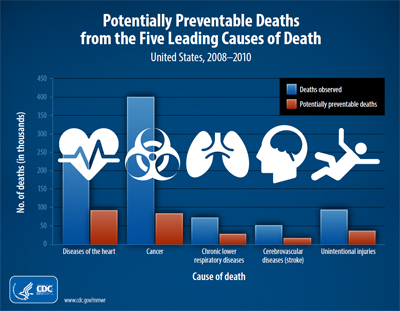 That’s because prevention of some premature deaths may push people to different causes of death. For example, a person who avoids early death from heart disease still may die prematurely from another preventable cause, such as an unintentional injury. Many of these risks are avoidable by making changes in personal behaviors. Others are due to disparities due to the social, demographic, environmental, economic, and geographic attributes of the neighborhoods in which people live and work. The study authors note that if health disparities were eliminated, as called for in Healthy People 2020 , all states would be closer to achieving the lowest possible death rates for the leading causes of death.